Kim and Christian are looking forward to your visit. Business people would appreciate the proximity of Sophia Antipolis, Grasse, Cannes and even Nice ad well as the rest of the French Riviera. Golfers would love beautiful courses almost in walking distance from La Cigalière. The Provençal style house, which has 4 comfortable bedrooms to offer, is set in a peaceful countryside full of olive trees and the roses and jasmine grown for the perfume producers in Grasse. The view sweep from the Mediterranean to the foothills of the Alps. The sun shines on the swimming pool from morning to dawn. Youtube drone presentation available , key in the following tittle on the search engine of YouTube : « villa de luxe entre grasse et valbonne ». Come and enjoy our privileged environment. Longtime expatriate round the world the family settle down in 2000 as time to retire had come. Children are gone so we are pleased to share our beautifull place since the house is to big for 2 persons during the summer season. Located in a very posh area we enjoy a very high quality silence in a protected and nice environment. In the neighbourhood the minimum land size of each property is 10 000 m², we know almost all our neighbours in a radius of one km... although all the facilities of large cities are available to us very closely. Surrounding the swimming pool about 300 m² of lawn. The total land of the property is about 8000m². Covered terrace in direct link with the kitchen to make very easy the management of meals and cooking. Solarium equiped with chairs sofa table umbrellas over 70m². Overlook the swimming and host the barbecue corner. Daily maintenance for perfect clear and clean water. Far from traffic roads quietness is a main feature of la Cigalière at the same time in few minutes you can reach all the interesting places on the Côte d'Azur. We insist on the proximity of 10 golf courses in a radius of 10 km. Monaco, Nice, Cannes are few tenth of minutes drive from la Cigalière. As long time resident we will give you valuable informations on restaurants, places to visit. 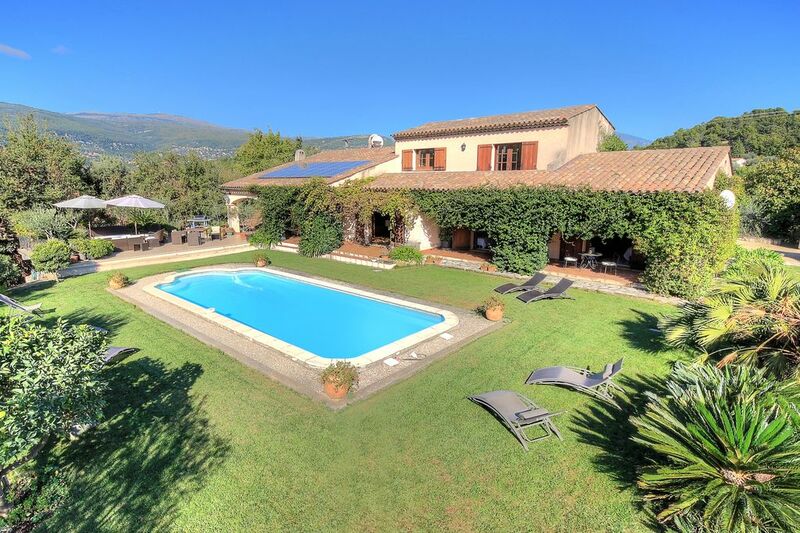 La Cigalière is located near the small village of Plascassier, 20 minutes drive from Nice International Airport, 5 minutes from Mouans Sartoux railways station and 10 minutes A8 Highway exits either Cannes or Antibes. We are in the posh area of Grasse at the outskirts of the world capital for perfume.Museum factories to be visited. Other Activities: French Riviera, casinos, sea side in Cannes ,Antibes,Nice.